LEMONT, Ill., Nov. 14, 2016—The U.S. Department of Energy’s Office of Science announced 55 projects with high potential for accelerating discovery through its Innovative and Novel Computational Impact on Theory and Experiment (INCITE) program. These awards allocate the multi-petascale computing resources at Argonne and Oak Ridge National Laboratories, two of America’s most powerful supercomputers dedicated to open science. The projects will share 5.78 billion core-hours and support a broad range of large-scale research campaigns to advance knowledge in critical areas ranging from sustainable energy technologies to next-generation aerospace designs to novel materials. The INCITE program is the primary means of accessing the DOE Leadership Computing Facilities at Argonne and Oak Ridge National Laboratories, and is jointly managed by the two centers. Researchers from academia, government research facilities, and industry submit INCITE project proposals, which are awarded on a competitive basis. The average award is more than 105 million core-hours—with some awards of up to several hundred million core-hours—on systems capable of quadrillions of calculations per second. Many of the project teams are building on findings from previous INCITE awards in their pursuit of significant scientific breakthroughs. DOE's world-class capabilities are also attracting new users. Fifteen of the 2017 INCITE projects are headed by principal investigators who have not previously received an INCITE award. The OLCF’s Titan supercomputer is a 27-petaflops Cray XK7 hybrid system employing both CPUs and energy-efficient, high-performance GPUs in its 18,688 compute nodes. The ALCF’s Mira supercomputer is a 10-petaflops IBM Blue Gene/Q system with 49,152 compute nodes and a power-efficient architecture. Despite continued upgrades, expansions, and advances in computing power, demand for leadership-class resources such as Mira and Titan continues to exceed availability, and, once again, more applications for time were made to INCITE than were awarded. Gorazd Medic of United Technologies Research Center received 35 million core-hours to assess high-order hybridized discontinuous Galerkin methods for large eddy simulation of complex turbulent flows in turbomachinery. Aiichiro Nakano of the University of Southern California received 140 million core-hours to study the synthesis and characterization of revolutionary layered materials. Jean-Luc Vay of Lawrence Berkeley National Laboratory received 100 million core-hours to study ultra-high intensity lasers that will enable accurate, realistic modeling of plasma mirrors and ion acceleration. Eilif Muller of École Polytechnique Fédérale de Lausanne (EPFL) received 100 million core-hours to simulate biophysical synaptic plasticity in reconstructions of the neocortical microcircuit to discover their synergistic functional principles. James McClure of Virginia Tech University received 115 million core-hours to advance a recently developed model of the movement of complex fluids in porous media, including land–water interactions, carbon sequestration, and fuel cell development. Christopher Holland of the University of California at San Diego received 100 million core-hours to study instabilities in tokamak reactors to better predict confinement in future devices such as ITER. The INCITE program promotes transformational advances in science and technology through large allocations of time on state-of-the-art supercomputers. For more information, please visit: http://www.doeleadershipcomputing.org/incite-program/. 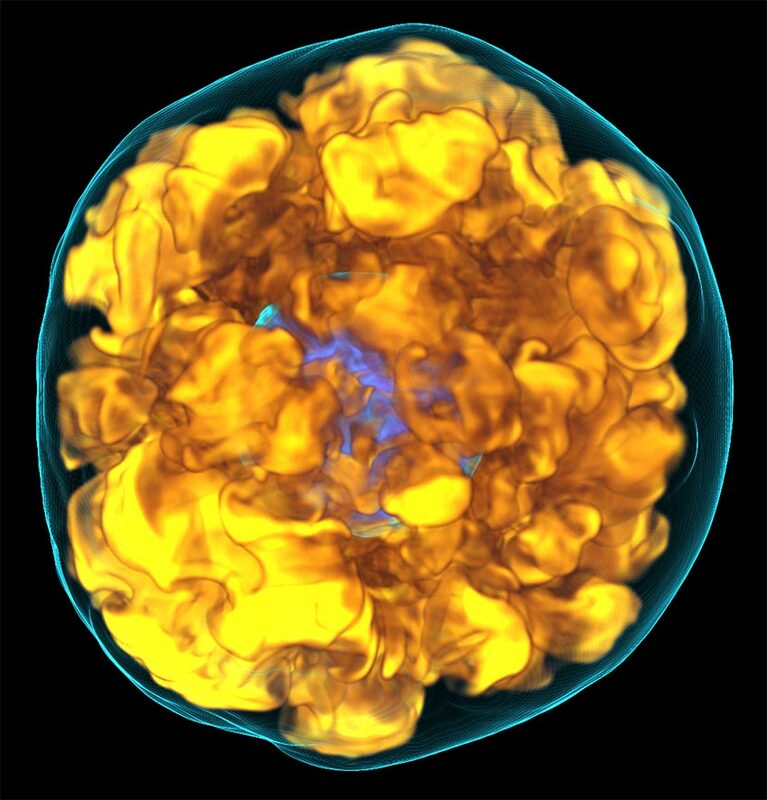 Volume rendering from a 3D core-collapse supernova simulation showing the development of strong turbulent convection driven by neutrino heating. This simulation is part of a series of high-resolution 3D simulations from an project using state-of-the-art high-fidelity neutrino transport, making the calculations extremely expensive. These calculations are possible only on leadership-class resources such as those provided by the INCITE program.